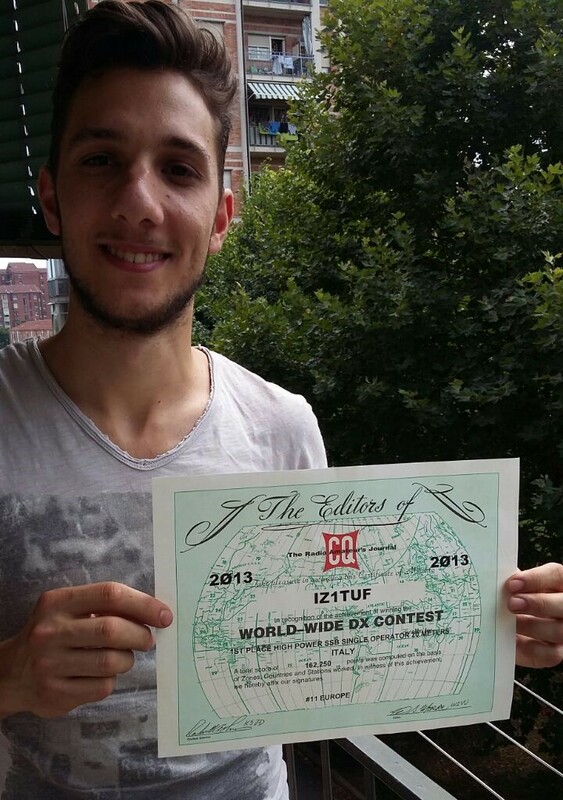 IZ1TUF proudly displays his certificate for winning the 20M High Power category for Italy in CQ WW SSB 2013. The economics of managing a paper ham radio magazine has been challenging. CQ has reduced their level of sponsorship for the contest over the years. They were no longer willing to pay the printing and postage required to send the more than 7000 certificates needed for the 2013 and 2014 contests. The World Wide Radio Operators Foundation (WWROF, wwrof.org) has stepped up to temporarily fill the vacuum. They pitched in to cover the cost of printing and mailing the certificate backlog (not only for CQWW, but also CQ 160m and CQ WPX). The WWROF is a non-profit organization that was founded to promote the sport of contesting and the hidden infrastructure that helps make it possible. We greatly appreciate their generosity. The certificate printing costs are around $1000 USD per contest. Postage is slightly more than $1 USD per certificate. CQ WW SSB 2014 had 2,061 certificate winners. CQ WW CW 2014 had 2,105 certificate winners. It adds up to over $5,000 per year just for the CQ WW DX Contest. That money has to come from somewhere. CQ Magazine continues to be a strong supporter of the contest. The WWROF has been very generous in providing the financial support for the 2013 and 2014 certificates. Unfortunately, this model of free certificates is not sustainable without a source of sponsorship. There is one easy thing you can do to help. If you don’t want to receive a certificate, you can state that by using the new Cabrillo header tag CERTIFICATE: NO. This will tell us not to send a certificate to you. I would like to share several options that we are considering. Stop sending paper certificates completely. The cqww.com web site already allows every participant that submits a log by the deadline to download their own certificate in Adobe pdf format. Only mail certificates to first time winners. This helps keep the excitement of winning a first certificate alive, while dramatically reducing the costs. Offer paper certificates only upon request and for a small fee. This is more work for us, but provides a method for the certificate winners to help fund the expense. Ask logging software developers to support the CERTIFICATE tag and set it to NO as the default setting. Fold the certificates in half and trim the paper size in order for them to fit in a standard 6″ x 9″ envelope. This offers significant postage rate reduction. Work with WWROF to raise funds to continue the certificate program. We all understand the challenge of rising costs and limited revenue. Services need to be reduced or new revenue sources discovered. We look forward to your support in whatever path we choose. Please use the comment area below to share your feedback and ideas. IMHO, reasoning as simple participant and beneficiary of the CQWW web-portal tools, I think that the option #1 ( “” Stop sending paper certificates completely. The cqww.com website Already Allows every participant That Submits to long by the deadline to download Adobe certified in Their Own pdf format”” ) will be the most smart and easy: perfectly “in line” with our time. I suggest the following: Have hams pay a small fee if they want a certificate. I don’t receive many CQWW certificates, as I tend to participate in multiop efforts, but as applied to ARRL contests, for me certificates are a huge waste. I get one for nearly every VHF contest, often for something like being the “1296 Band Winner” with something like three qsos in one grid. I’d much rather see that money spent working for RFI or Frequency Defense purposes. The addition of CERTIFICATE:NO is a good first step, with contest sponsors using that info. OK, I’m an old guy. I don’t win much of anything, but even after 50-some years in the hobby every “real” QSL card, and every contesting certificate in the mailbox is a small treasure. I don’t care if it’s folded. The CERTIFICATE:NO is a good idea. The idea of printing your own or paying a fee leaves me cold. Option #1 is fine with me. It would be nice if you sent out an email, to either the cq-contest reflector or to each qualifying entrant, when the certificates are available for download. I have a lot of paper certificates. I enjoy getting them. But realistically the vast majority are sitting on a shelf and not being displayed on the wall. Recently ARRL has stepped up certificate mailings – not just to top scores but to any participant above the low-hundreds-QSO’s level. Many EU and SA contest organizers send out a lot of certificates – timed to arrive in the weeks before the next contest running, a good way to encourage activity in an event that otherwise we might overlook. I think sending certificates increases the participation in contests and is a good thing. If a donation to WWROF could help CQ increase number of certificates to small-timers, I would make it. I feel that the best solution is to allow certificate winners to print their own, with an option to pay to have a certificate mailed for those who choose to do so. I would be perfectly happy never to receive another mailed certificate, so long as I have the option of printing my own from PDF. It has never made any sense to me for CQWW certificates to be oversize – 8 1/2 by 11 is the size I would print, and also a standard frame size. I like the certificates and I am fine with printing them myself. Option 1 seems like a good way to go. “Stop sending paper certificates completely.” is fine with me. If the money isn’t there, it isn’t there. I do keep my certificates, when I get any, but they basically hide in a scrapbook. I don’t about the difference between printing it at home versus getting it mailed to me. Just email me that I have something, including a link to the PDF, and that’s all I need. A ‘push’ from an email will really help as I have been surprised many times in the mail with victories(e.g. well-placed in section) I didn’t know I had. So, a little prod would save a lot of the former joy of the mailings. I like options #2 (first time winner) and #4 CERTIFICATE=NO in logging software. An unsolicited, mailed certificate to a first-time winner is a nice bit of encouragement. That certificate is likely to end up on the shack wall. After that . . . let those who want “wallpaper” print their own. If there is no CERTIFICATE field, then no paper Award. Amateur Radio is no longer paying its way with various magazines, various stores and many organizations around the world. Yet Us Hams expect the contests to carry on and the Organizers to pick up the tab every time .. why should they ??? Hell people wake up, we pay to sit the exam , we pay to get a license, we pay to belong to a Ham Club, pay to belong to their National Body .. There are no Olympics or Common Wealth games for Amateur Radio. It’s a sport that costs money and I believe its one of the very last Global sport in the world that doesn’t charge an Entry fee, most other sports do and they are doing ok. I don’t mean a charge of $ 50-00 I mean a contest charge to enter around $ 5.00, this is to help offset the costs of certificates/ postage / admin etc we can’t expect QRZ , CQ ARRL , RSGB, NZART etc to carry the Global can for costs of certificates and postage without some effort from the contesters to help off set increasing costs.. I have no idea what it costs CQ / QRZ etc to mail an A4 Certificate to ZL but to send that very same around NZ will cost you $ 2.40 now include the envelope, and the certificate and the cost will be up around $9-00+ NZ..
DX peditions only send QSL cards after payment so why not Contests fair is fair.. Those not wanting a certificate can still submit their logs as check logs Free no fee.. Sadly the days of us getting certificates for FREE are just about over ..
My opinion is that paper certificates should be available to those who qualify(? top 10 percent/ top entrant for reach class/call area) for a fee of $5 to $15 each. The policy of offering a certificate to all entrants to be printed by them (as is currently done in the WAEDC contests, and are currently available for the WPX contests) I think decreases the competitiveness of the contest. Funding should be primarily thru WWROF. I like paper certificates. In order, to reduce the financial costs suggest leaving certificates only for download on the site. Finding the certificates available on the website was a pleasant surprise. Great idea. I printed out several for local club members who were casual participants and presented at a meeting. We now have some more than casual ops. Wallpaper is an incentive. Mailing without cost would be Ok and merited for the top ten. If someone else wants it mailed, a fee to cover costs is fine. I like achievement (not participation) certificates and have every one framed on the wall. Print your own is definitely the way to go and I wish all contests would do it. Sending anything through the post, like magazines and paper QSL cards, is a total waste of time, money and trees IMO. Print your own is a sensible option. No need to mail them. I now print my own FCC ham license. I know it will be a problem for foreign countries who will easily suspect that printing as another tip-off to fraud. That is only important if one is using their FCC paper to support getting a foreign license or DXpedition permit, but it feels cheesy even beyond that. Unfortunately, the big gun people who get most of the ham award paper are threatening the value a little pistol, especially a citizen outside USA, gives to the paper award. The hams who value the paper REALLY DO. Maybe only mail award paper outside the USA where people I know do actually value it still. I have a whole stack of certificates sitting on the table here. Some of them haven’t even been opened yet – still in their envelopes. 1. You might want to consider nudging the contest software guys to somehow make the CERTIFICATE option a little more accessible, perhaps even defaulting to NO. 2. Is there any reason certificates (perhaps resized a bit) couldn’t be distributed via the buro to save on postage? I do not have any clear opinion while I totally agree on the necessity for fixing financial issue. Regardless of the conclusion, I will label NO for CERTIFICATE: tag in cabrillo explicitly when submitting the log. I’m all for option #1 (”Stop sending paper certificates completely. The cqww.com website Already Allows every participant That Submits a log by the deadline to download an Adobe certificate in pdf format”) will be the most smart, easy, cost savings and works just fine. Those that do not have access to a ‘good’ printer – take the file on a thumb drive to Kinkos or Staples and have them print it in color on heavy paper. I strongly support the first option, with the added request that the pdf include recognition of how the entry placed within their category and region. This is particularly important when you’re contesting from a region where you’re not competitive on a world or national scale. I am very happy to print my own certificate. How about a sign up web page for those people that do not want to receive a printed certificate. The cabrillo option is fine too but could be easily over looked. I’m happy to pay a reasonable fee to cover the costs and postage associated with a certificate I wish to receive. Round it up to cover free certificates for first time winners. I support the idea to print and mail certificates to First Time Winners. For others who would like additional awards, let’s offer a solution where certificates could be requested against covering of printing and postage. This does not mean that the contest organizer should make money, but simply cover costs. If the suggested system has the result that participation is significantly reduced compared to years when certificates were distributed more widely, then let’s have a new discussion then of returning to the old scheme. What makes a certificate anymore special because it arrives through the mail? I would go for option 1 but,as a first step, adding the new cabrillo line with the default ‘Certificate No’ should reduce the Admin costs and tasks significantly. There are two issues for organizer to think about and to find a balance. First is obvious-economical. Current solution to download own certificate in Adobe pdf format is fine. Problem solved. But, sending certificates surely increases the participation in contests. This is part of contest development process and what organizer wants. Keep sending smaller certificates for next few years, to reduce postage cost. If we can let you know in Cabrillo that we do not need certificate, this will additionally reduce number of certificates to be mailed. I guess number of those who will download and print certificate is significant. Also, ask participants for small donation. Remind us-in rules, with messages from robot, on reflectors, WEB etc. We will all do our the best to keep CQWW growing. Stop sending certificates but require submission of an email address. When results are complete email those qualifying for certificates a congratulatory note and instructions on how to download their certificate. Follow up 2 months and 2 weeks before the next contest with emails encouraging participation. Then, arrange with a printer (perhaps a QSL printer) to print and mail certificates for a fee. Do it in such a way that other contests can climb on that bandwagon. That will encourage the printer to participate. Then the winners’ emails can contain a link to download and a link to print for a fee. Finally, the reminder emails should be sent to all participants and list their scores in all prior events that you have records for. Allow PDF download AND allow winner to pay for a delivered paper copy if desired at a cost that is neutral and does not cost CQ. Like many OT’s in the contest game, I have drawers filled with certificates. I do have one framed and on the wall, my 1974 Top USA in CQ WW CW! But I remember my first ones and they were an encouragement. We need to do things to encourage new contesters to get into the game so one question for them would be what would they consider to be of value. Personally I think the options of no certificate option in the log plus allowing printing of your own plus raising funds to support certificate printing should all be done. Folding is not an option — ever try to frame something that’s been folded? I like the CERT-NO, and print myself, but several casual participants in rarer DX entities may not have that option, and you wouldnt want to discourage participation. If CQ doesnt pay for the cerificates anymore, why is it still CQ WW ? Why isnt it WWROF WW ? If more people knew about WWROF and their involvement perhaps more would join…. That is a great idea, I think with the PDF available, the contesters can handle their own printing. Print on different type of papers and create their own frames to put in. I like option #2. If I want a cert, I am happy to download from the website. I like the PDF option plus the ability to pay online and get a paper certificate, sort of like OQRS. Has the WWROF considered this as a revenue stream? If ICOM can sponsor unsponsored ARRL contest plaques, perhaps Kenwood, Yaesu, RF Concepts or Elecraft could sponsor WW certificates. If the cost is, for example, $10k, set the sponsorship rate at $12k. The residual becomes a donation to WWROF. For the rest Stop sending paper certificates completely. They may download their own certificate in Adobe pdf format. I like the paper certificates. The quality is better than anything I could print out so it looks like I really received it. Versus what I print out looks fake, like I made it up to make it look like I did good in the contest. I would be okay with smaller certificates 8.5″ x 11″ or international A4 size (I think that is close to 8.5 x 11). I have enough certificates that I rotate the ones on display, using all the same frame size. This means I trim the CQ certificates to fit the frames. On-line is the way to go. There’s no need for ham radio to remain in the 20th century. Take advantage of CABRILLO and computers. Default to “PDF” with an e-mail notification. “CERT” would generate another e-mail message to pay on-line for a mailed certificate (different rates for U.S. vs. foreign). And “NO” will suffice those who have too many or don’t want one. Receiving certificates/plaques/trophies is always a pleasant surprise. But economics dictate appropriate changes. Sponsoring contests (by commercial manufacturers) makes for good PR. But I doubt few or none of us makes purchase decisions based on that sponsorship. Stop sending paper certificates completely. If anybody wants one, printing it should do. This is the 21st century and printing your own or having one mailed does not diminish the effort to achieve the certificate. Sending money to have a volunteer mail a certificate print and mail one is a complete waste of time and effort. Option 1 works for me. Stop mailing all certificates and implement a Cabrillo CERTIFICATE option, with NO as the default if not specified. Publicize the new option as much as possible and put it in boldface in the rules. Also modify the response from the log bot to explain that the default is NO and to resubmit the log with CERTIFICATE:YES if a mailed certificate is desired. Lean on the log program authors to add the CERTIFICATE option, defaulting to NO. After a couple of years, you’ll have a pretty good idea of how many participants want a certificate mailed. If the number is large, you’ll have to consider requiring payment. If the number is small, you may be able to eliminate mailing altogether. What about emailing certificates? The CERTIFICATE:NO option will require a software change anyway (i.e., producing a mailing list of those who said YES), so why not expand that and allow a third parameter: EMAIL, which would send the certificate to the submitting email address (which, I believe, is where the UBN report goes.) The reason for not automatically emailing certificates is that some participants may not be able to receive large attachments or won’t want them. Finally, publish step-by-step instructions for printing certificates, including how to print Overlay certificates. Put a link to it in the bot response email. Once framed, Its almost impossible to distinguish a certificate received by mail vs. one printed on-line. And, the certificate winners can have them displayed their walls immediately after results are released. So the first option is fine. But, consider sending an email notification to the certificate winners. I would go with a combination of One and Two. Receiving your first certificate is a great excitement and helps having participants from rarer countries. However I admit that know each time I receive a certificate even for a 1 hour participation in a contest I’m thinking to myself “They could have saved some money”. I publish the online “K1BV DX AWARDS DIRECTORY” which lists rules of over 3000 long term and usually about 50 short term awards from over 100 DXCC countries. During the past 2 years, sponsors of short time awards have almost UNIVERSALLY changed their operations so that most awards issued are Electronic image certificates (JPG, PDF). About half of the sponsors will send a pre-printed certificate at the request if the applicant requests. There is always a charge for postage in these cases. A smaller percentage of the sponsors of long term awards have changed their operation. I would say that 90% of them only offer a paper printed version, but I’m seeing greater use of E-certificates as time goes on. I fully support the use of E-certificates for contests due to the speed of delivery and savings to the contest promoters. I vote for option 3 first and if not feasible I would vote for option 5.